On the 9th and 10th of November the Nelson Dojo was very pleased to host our first ever seminar. training which began at 7pm. We encountered an unexpected unpleasantry when for whatever reasons the heating system in the gym wasn't working all that well....actually not working at all. It mattered little... as once we got going the sweat began to pour and everyone quickly forgot about the cold. Sensei Brad Gillespie and Shihan Don Corrigal were the guest instructors. The passion and knowledge these two have of Kyokushin fighting, is endless. Sensei Brad began the clinic and focused on basics, such as the importance of a good stance, controlling your emotions and fatigue, and many combinations and counters...far too many to mention. Shihan Don finished off the weekend with focus on proper balance, body mechanics, and more fundamentals, before bringing out the pads for some brutal circuit training, and speed drills. There were no less than 15 stations and everyone was to go all out for 30 seconds on each one with about 5-10 seconds rest...just enough time to move to the next station. Going all out for 8 straight minutes is exhausting to say the least, I suggest everyone try it sometime if they want to taste blood in their lungs. With somewhere around 30 minutes to go it was time to put everything learned to use...the hand speed, the blocks and counters, and most importantly...don't let your opponent know you're exhausted. 30 minutes of sparring was last on the agenda. The rounds started lightly but picked up in intensity as they wore on. Bit by bit the group of guys on the floor got smaller and smaller, until some of the most skilled fighters were all that was left standing. The environment felt alot like it does at the Black Belt fights from summer camps, as each dojo was hooting and hollering for one of their own. Although everyone was bruised and banged up from doing nothing but fighting for 7 out of 18 hrs there were adrenaline smiles everywhere. That ended the training but not the weekend. From there the gang headed out to Ainsworth Hot Springs for a healing soak in the caves and 106 degree water. There were a few who wouldn't do the ice water plunge....I won't mention any names but his initials are B.G. The day ended with a Sayonara dinner and the presentation of the Katana to the student who trained the hardest over the weekend. It was not an easy decision to make because it was obvious that everyone there came there to TRAIN, and each person gave it all they had. Shihan Don explained to all the significance of a Katana, and how it exemplifies the soul of a warrior. It was a fitting speech before handing it over to World Tournament competitor Jordan Forget. Everyone, including the spectators were in agreement that when Shihan Don shouted "Yame" for the final time that Jordan had left everything on the floor. It literally came down to to the last 60 seconds to determine the winner...honorable mentions go to Alex from Invermere, Dallin Anderson of North Richmond, and Callum Gibson of Calgary....well done guys your spirit was evident to everyone in attendance. The after dinner party lasted for a few more hours and the wine and beer flowed as freely as Kyokushin memories and stories from days and camps gone by. By all accounts it was a terrific weekend with pretty much everyone wanting to come and do it up again next year. 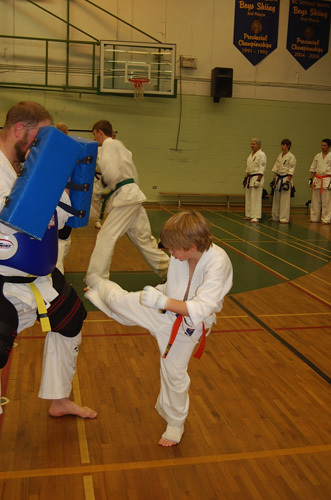 On the weekend of November 9th, a group of around 50 karate-ka descended on the sleepy town of Nelson BC for a first of it's kind event put on by Sempai Keith and the Nelson Dojo. We were there for a 2 day seminar dedicated to fighting, with the focus being to make us all aware of ourselves as fighters. I arrived with a group of 5 from Calgary for this event, and after checking into our quaint hotel, which looks like it exploded off the pages of a Swiss children's book, we made our way to the Trafalgar school to begin the first of 3 trainings. The room was buzzing, and after saying hi to those we knew and meeting those we didn't, training began. We started with a spirited warm-up, as it was apparent that the gym's temperature was going to be cool for the weekend and it was up to us all to warm it up! After building up a sweat, Sensei Brad took over and set the tone for the rest of the weekend with a focus on bringing our training back to basics. We started simple, and through the remainder of this class the 2 classes that followed Saturday, we progressed through a series of combos and footwork. Shihan Don took over on Saturday, and we continued to work on improving, with a focus on body positioning, posture, movement, speed, and a number of other components all geared towards us being more aware of how we fight, why we fight this way, and how we could do it all much better and more efficient. There was pad work and combination drills throughout the classes, and of course, some energetic sparring. Everyone brought their A-game, and the energy level in the gym stayed electric throughout the trainings. It was great to see the progress made by all, and that what we were being taught was sinking in and being used. After the classes were finished and pictures were taken, we all departed for a welcomed trip to the Ainsworth Hot Springs not far from Nelson. The scenery was beautiful, and the combination of the polar temperature cooling pool mixed with the incredibly warm hot springs worked wonders to help sooth any sore muscles and bruises. Once done there, we all headed back to town for an amazing Sayonara meal at a local restaurant owned by Steve Kirby, a fellow participant in the weekend's training. After a few words about the weekend were said, and a presentation of a katana was made to Jordan Forget, the most spirited participant of the weekend, we all settled in and enjoyed an amazing feast! Steve and his crew went all out for us, providing beverages and a meal certainly fit for a bunch of karate fighters! I ate so much I felt like I was going to explode, but when you have BBQ beef, salad, beans, and buns at your disposal it's hard to stop at one plate. This weekend was a joint effort by many, and I'd like to thank Sempai Keith for making this happen, Shihan Don, Sensei Brad, and Sensei Jeremy for their instruction and guidance throughout the weekend, the Nelson Dojo and it's volunteers for taking care of us for the weekend, Steve and his staff at the restaurant for providing an incredible meal and venue for our Sayonara party, and all those who participated for their spirit and hard work throughout the weekend. We all benefit from experiences like this, and after having one of the best training weekends of my Kyokushin journey, I look forward to next year! OSU!! The dinner alone was worth the price of admission. Steve Kirby, (owner and head chef of Max & Irma’s restaurant, and a member of the Nelson Dojo) put on a fabulous Texas BBQ sayonara dinner to end the Nelson fight training seminar. It’s difficult to provide both quantity and quantity, but Steve and his staff pulled it off with style. The hours of training and the long soak in the Anisworth hot springs had worked up some fierce appetites, but there was plenty enough for everyone to over indulge. The food was so good it elicited a public marriage proposal for Steve from a member of the Cranbrook dojo (I’m not sure how many more proposals he received in private). It was a great ending to a weekend of training where the attendants pushed themselves as hard as they could for the entire duration. The feedback I heard from the camp was that it was universally and enthusiastically enjoyed by all. There was some discussion at the sayonara party as to why everyone felt it was so successful and the consensus seemed to be the format, duration and quality of instruction. The seminar consisted of 3 training sessions (2.5 hours, 2 hours & ~2 hours), with the first training session on Friday night and the remaining two on Saturday morning. The focus was almost exclusively on fighting skills. The combination of a single focus (fighting) and the fact there were only three training sessions seemed to motivate the participants to push themselves harder than they would have at a longer camp, where you need to keep something in reserve for the next training sessions. I particularly enjoyed the technical nature of the training interspersed with high intensity training and sparring. The chance to spar with people from so many different dojos, including active tournament fighters, was particularly valuable. Sensei Brad Gillespie of the Calgary dojo ran the first session. It started from the basics of fighting stance, posture, focus (kime) and mobility (footwork), progressed to attack and defense combinations with a partner, and finished up with sparring. The first half of the second session was also run by Sensei Brad and built off the concepts and skills of the previous evening. We progressed in to counter attacking, Kosaho (Simultaneous defense-attack) and beating your opponent to the attack. The second half of the session was run by Shihan Donald Corrigal of the Cranbrook Dojo and continued the fight training focus, ending with some wicked high intensity pad work, which I really enjoyed. The third session was also run by Shihan Don consisting of more fight drills and combinations and ended with a longer sparring session, which was great way to finish the training. It’s through fighting that we connect and get to know each other in Kyokushin, and in a fighting art it’s through fighting that we gain respect for one another. This entry was posted	on Thursday, November 15th, 2012 at 8:14 am	and is filed under Uncategorized. You can follow any responses to this entry through the RSS 2.0 feed. Both comments and pings are currently closed.